Wave Encoding/Playback – Records files in Wave format. Voice-Activated-System - Recording stops when sound stops. 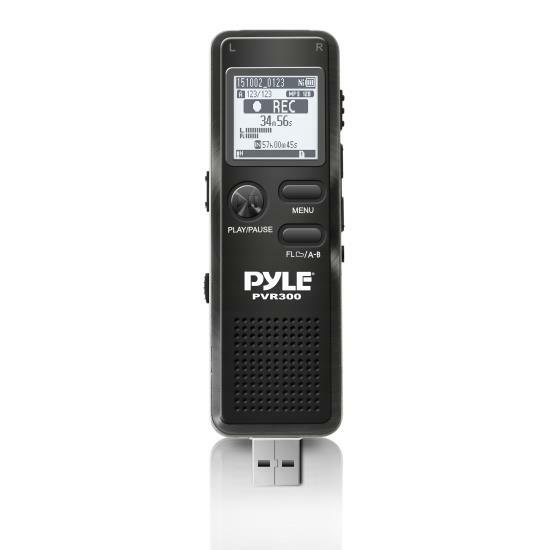 Use the Pyle PVR300 Digital Voice Recorder at home, in the classroom or in the office. It's easy to use and creates audio files (.wav) that are easy to share. Comes with built-in Rechargeable Battery, Charging Cable and 4GB built-in memory, so you can record hours of audio or voice. Supports Micro SD Cards up to 8GB (not included). Once you record your file, connect it to your PC via USB interface to save and share. Small size for convenience and portability.